It was one of those rare moments that happen too quickly, that you’re too engrossed by to have a chance to take a picture of. And yet it’s a memory that’ll definitely stick. After checking me out, the tiny little scruffy thing hopped off again, stood up on its hind legs to look at me and ran off to join its tussling friends. Meerkats are curious little things. Perhaps I’d encountered them before at zoos, but never in such close proximity. It’s easy to see the confusion with cats that befell the Dutch when they called these creatures “lake cats” upon their discovery in the South of Africa – their only natural habitat. With small, pointed faces, brown-striped fur and long tails, it’s no big stretch to confuse them with cats – from a distance. As they approach you, however, their differences become apparent. The meerkat comes closer to a grey squirrel in size than to a cat. They also have dark patches around their eyes which helps them cut down on the sun’s glare. It was one of those hearsay things that led me to this café in Seoul. 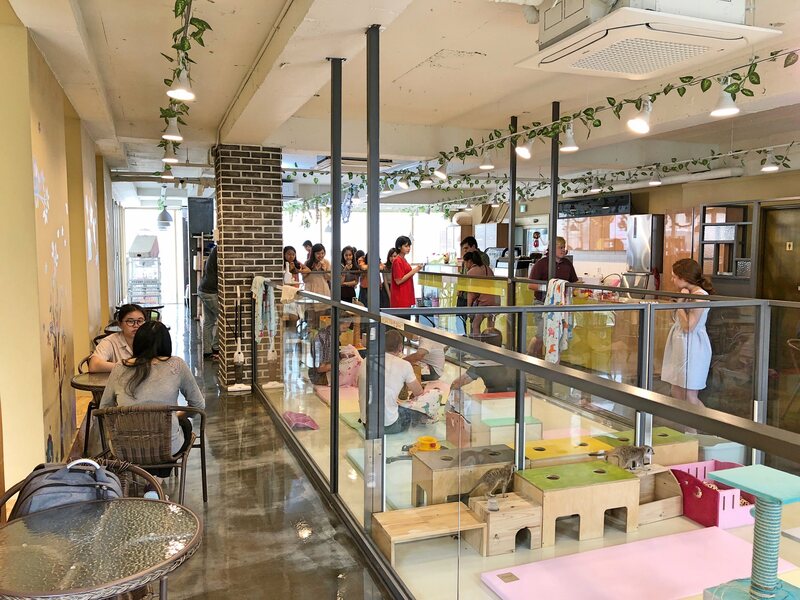 Yes, a café, not a zoo! There are dog cafés in South Korea’s capital, cat cafés aplenty, even raccoon and owl cafes, but the concept of a meerkat café was new to me. I didn’t know much about these small omnivores belonging to the mongoose family, but I was curious. 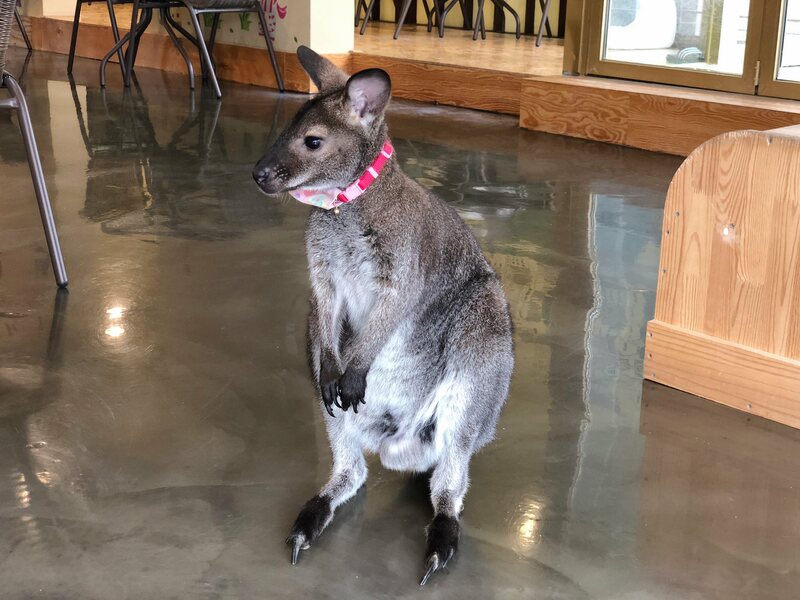 Little did I know that the first animal to greet us would be a wallaby! Kong happily hopped over before we even had time to properly close the door behind us. She gave us a little greeting kiss on the cheek, and danced around full of curiosity. She had another friend, but he was calmer and more reserved. He didn’t hop around quite as much, but we were beaming, happy to stroke him nonetheless. We were lucky, because the place got busy with the approach of the late afternoon. 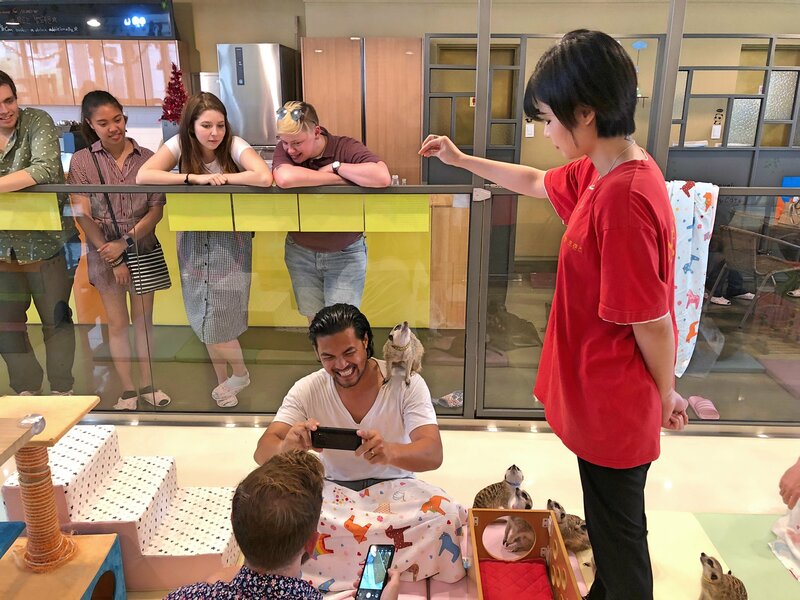 It’s something when you’re trying to compete with too big a crowd for the animals’ attention, and something else when they’re given the space to come to you. Despite all this it was hard to leave. There’s a certain effortless beauty in simply watching them interact with other humans. Meerkats are extremely social animals. They hang out in large groups called mobs, usually 10-20 individuals. All do their part by helping to collect food, taking care of the babies, and watching for predators. They are extroverted and chatty, with at least ten different vocalizations. In the wild, they live together in burrows to keep safe from predators and out of the harsh African heat. And as much as they scoff at silence, they also don’t believe in space. Meerkats create entire underground palaces: burrows more than five metres long, with multiple tunnels, entrances, and rooms. We’d turn a corner and find them all heaped together, passed out one atop the other, looking strangely comfortable. It was the state we first found the meerkats in at the third-floor café in Seoul. Piled on top of each other on the narrow top step of a three-step ladder, snuggled together in a heap, despite the occasional member falling off only to somehow dig itself back in with a grumpy mumble. It was the sight of adorable chaos. We stood there staring at them with simultaneous incredulity and fondness, when one of the staff inside the enclosure asked us with a grin if we’d like to join. 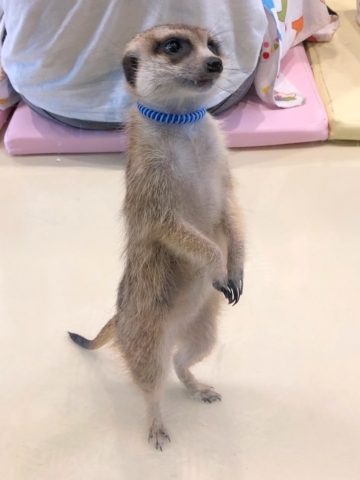 Having explained to us the rules in slightly broken English – meerkats are very sensitive to sound, thus do not raise your voice; they have a great sense of smell, so they may try to climb up and bite your lip or ears – we started to grasp the delicate nature of these tiny animals. One of the cutest moments were the meerkats perching on the highest object they could find, turning their heads ever so slightly, with a simultaneously blank yet all-knowing expression on their face. In the wild, there will be one meerkat, called a sentry, taking over the job of watching for predators. 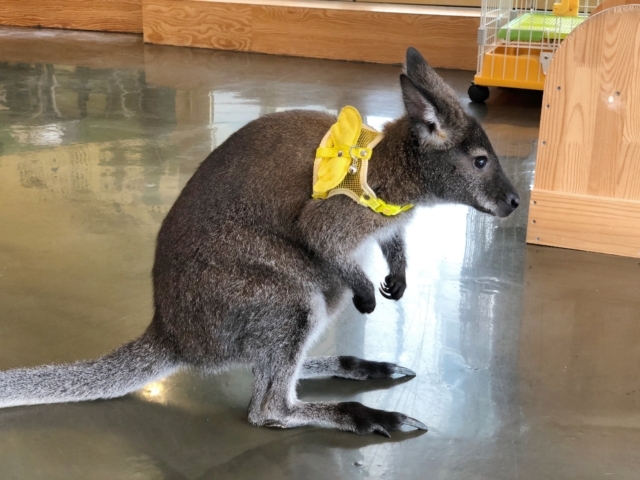 It will find a high point, such as a termite mound, and perch on its back legs, scanning the sky and desert for predators such as jackals, eagles, and hawks. 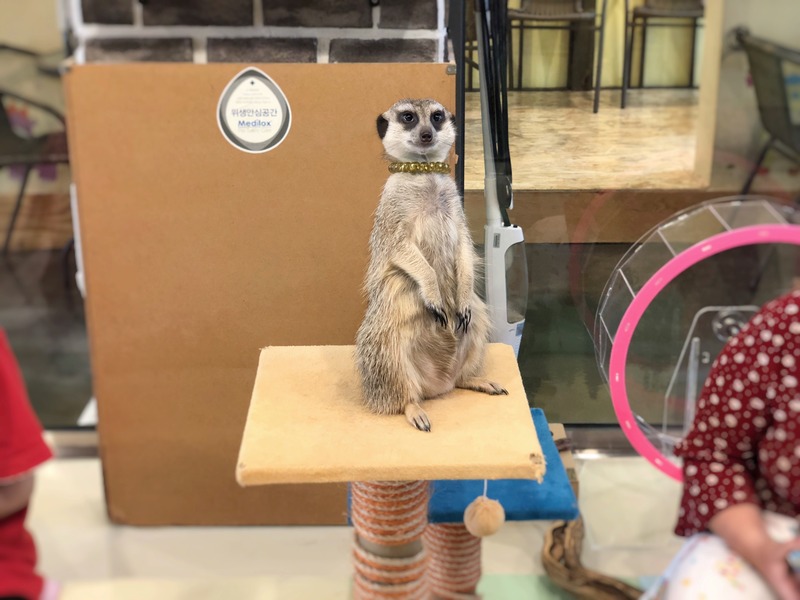 There were no birds at the Meerkat café in Seoul, but it wasn’t lacking of other species. We also discovered two very chilled cats, a raccoon, and two arctic foxes. If you come at the right time, for us it was early afternoon, you can also join in during feeding. The staff was more encouraging than the visitors were brave when it came to giving snacks to the arctic foxes. The raccoon, star of the moment, would lean forward to grab its snack as if clapping its paws. There are cafés I visit once for the unique experience, and there are others I’d happily visit again and again because they are exciting every time I return. 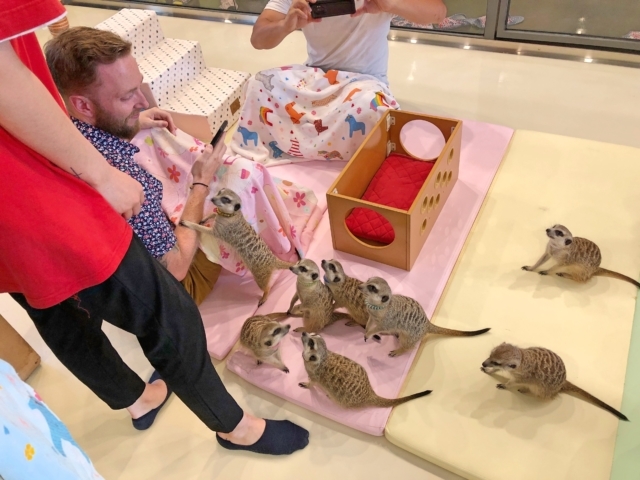 The Meerkat café in Seoul is definitely one I’d return to many times, because those little creatures can never cease to fascinate.